courses and vacations, telemark ski touring, free-heel skiing and telemark coaching courses in Europe, North America and Worldwide. Telemark Steep & Deep Camp , an instructional camp for intermediate to expert telemarkers. Learn to ski steep terrain, learn about off-piste snow conditions and gain backcountry experience. The Telemark Ski Company operate specialist instructional courses and tours in Nordic, Telemark and cross country skiing led by highly qualified instructors. Telemarking and freeheel skiing in Scotland, Italy, France, Sweden and Norway and beyond. 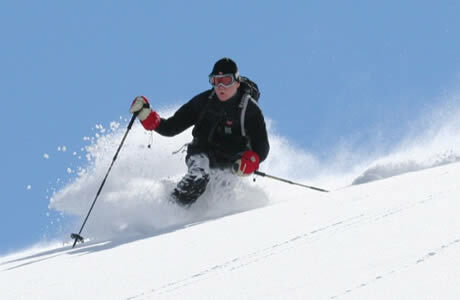 On and off-piste adventure telemark skiing instruction for all levels from absolute beginners to tele racer training. Courses run in Tignes and Val d'Isere. A telemarkers Mecca, with some of the best lift-served telemark skiing in the Eastern US. Uncrowded slopes, natural snow, award-winning terrain and fine tree skiing attract free-heelers in abundance. In this section we use telemark skiing (or telemarking) to mean downhill skiing using free-heel bindings, where it's possible to use a telemark turn. This might be on-piste telemarking or backcountry/off-piste telemark touring. We have separate dedicated sections for related free-heel activities such as cross-country (track) skiing and Nordic ski touring. The difference is generally in the type of ski and binding used, and the type of terrain skied. The equipment used in cross country and Nordic skiing will differ from that used in telemarking; in general, for cross-country/Nordic skiing, everything will be much lighter weight and the narrower, straighter skis will have a Nordic camber (wax pocket) to allow for climbing hills using grip wax (or a fish-scale base). Telemark ski terrain will generally be steeper and is usually exactly the same terrain used by alpine (downhill) skiers, be that on or off-piste. See this site for and excellent skiing glossary to help understand the differences! The travel-quest telemark skiing holidays section lists companies offering telemarking tours, courses, holidays and vacations. See the definition further up the page for more details.